Tonight, as you settle in to watch the very first presidential debate of 2016, it's important that you represent your candidate. Fans of Donald Trump are sure to pop open a bag of Cheetos, the food which most closely resembles their candidate of choice. Supporters of Hillary Clinton will be sure to enjoy some vegan appetizers in a nod to the Clinton's own dietary lifestyle. But what sort of drinks do you pair with these respective culinary delights? Many other websites have created their own cocktails in honor of Trump or Hillary. Sadly, I found most of them to be totally lacklustre. Don't worry, I've got you covered. 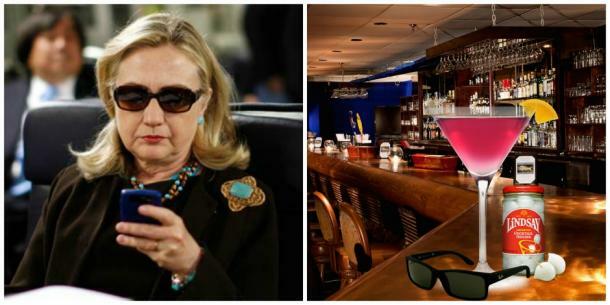 I worked very hard all day in the YourTango mixology labs* to create two cocktails that perfectly embody the spirit of either candidate. I hope you'll enjoy. Note: This is a work of satire. Whoever you choose to support, please enjoy your cocktails responsibly. Friends don't let friends actually imbibe the bodily fluids of strangers. 10 Trump And Hillary Tattoos That PROVE Election 2016 Is The CRAZIEST!